I love the idea behind these “Class of ’88” beers. A bunch of breweries who were all founded in 1988 have gotten together to created a commemorative recipe. They then go to their respective brewery and brew said recipe. The result being the beer I’m here to review. 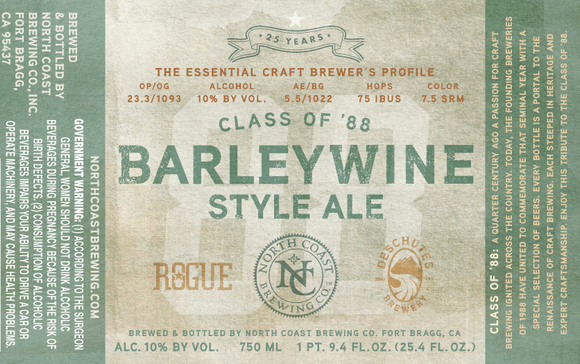 CLASS OF ’88 BARLEYWINE STYLE ALE is a collaboration between North Coast, Rogue, and Deschutes. This particular version was brewed at North Coast and has an even 10% ABV.